The switch contacts in a reed relay are operated by the magnetic field generated by the coil which is wound around the hermetically sealed reed switch capsule. When these reed relays are stacked close together, the field from adjacent reed relays will partially oppose the magnetic field from the reed relay alongside, reducing its sensitivity. This means that a higher coil voltage will be required to operate it. For very small reed relays, this increase could be as high as 40% which means that it may not be possible to operate the reed relay at its normal coil voltage. 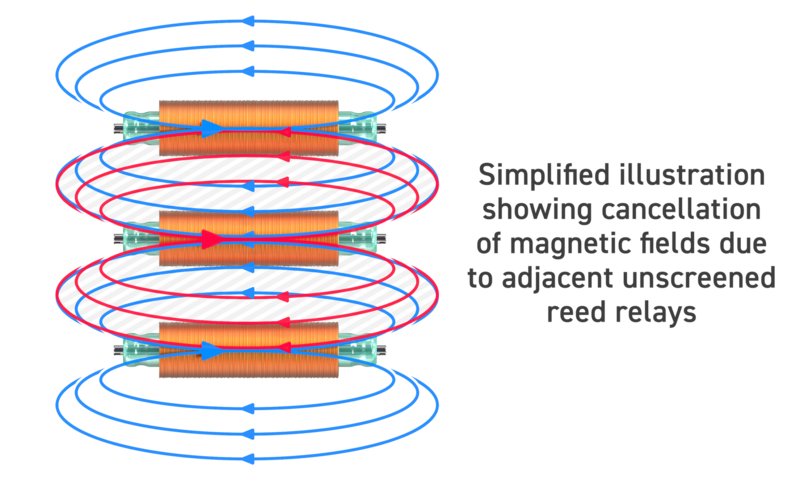 Please reference the magnetic field illustrations below. Pickering reed relays are fitted with a Mu-metal magnetic screen rather than one made of steel because of its high permeability and very low magnetic remanence. This screen concentrates the magnetic field, greatly improving the device’s efficiency and reliability and allowing side by side stacking to maximize density. The high packing densities that can be achieved when using Pickering reed relays is illustrated below on a PXI High Density Reed Relay Matrix Module from our sister company Pickering Interfaces. This module uses 360 Pickering Series 111P reed relays, plus 156 Pickering Series 117 reed relays. A total of 516 reed relays! Magnetic screening is absolutely essential for reed relays mounted on a close pitch to eliminate magnetic interaction issues.